Can Meditation help reduce blood pressure? - Doctor Hermann M.D.,P.A. Posted on December 23, 2014 by Reshma Patel, M.D. One of the first things that happens when you enter a doctor’s office is your blood pressure is taken. Why is this important? Well, blood pressure is the measure of how much blood your heart pumps and the degree of resistance to blood flow that your arteries experience. Blood pressure is expressed in two numbers, for example 120/80. The top number, known as the systolic pressure, reflects the pressure in the arteries when your heart contracts. The bottom number, known as the diastolic pressure, reflects the pressure in the arteries when the heart is relaxed. A normal blood pressure is considered less than 120/80 and ideal. High blood pressure is important because it is the most common risk factor for cardiovascular disease and affects nearly every 1 in 3 adults. The causes of elevated blood pressure are many; however, a most significant source is stress. When we experience or even perceive stress, our sympathetic nervous system (our ‘fight or flight’ response) becomes activated. This creates a more rigid tone in our arteries requiring our heart to contract with a greater force, over time leading to elevated blood pressure. Often high blood pressure presents with no symptoms and is commonly known as the “silent killer”. Understanding this becomes vital so we can find ways to manage our stress and the way we respond. Several studies have shown that meditation can be helpful in reducing blood pressure, in particular Transcendental Meditation. In Transcendental Meditation, you choose a meaningful mantra, sit quietly with eyes closed, and repeat the mantra silently for about 15-20 minutes twice a day. The idea is to promote a state of relaxed yet concentrated awareness, which allows you to let go of negative thoughts and distractions. According to the American Heart Association, Transcendental Meditation is the only meditation practice that has been shown to lower blood pressure and should be considered in the treatment plan for individuals with high blood pressure. 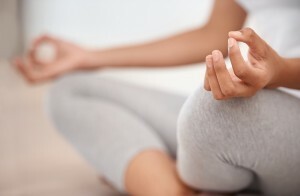 They further reported the finding that lowering blood pressure using the Transcendental Meditation technique is associated with a significant reduction in the rates of heart attack and stroke. So, can meditation help reduce blood pressure? The research says yes. Consider spending a few minutes daily developing a practice in transcendental meditation. At Hermann Wellness we offer Holistic Primary care to our patients. Our offices are located in Tampa and St. Petersburg. Please call the office at (813) 902-9559 for more information or to schedule an appointment. How Can B Complex Vitamins Help Me?